Join us on the beautiful University of Alabama campus, June 4-28, Monday thru Friday each week. Positions fill up fast, so hurry and submit your application before May 1, 2018! Please view the activities from the 2017 Summer Schedule. 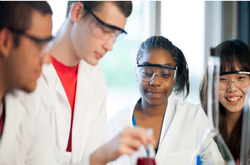 The University of Alabama (UA) Robert Noyce Summer Internship and Scholar- ship/Stipend Program funded by the Na- tional Science foundation, is designed to increase the number and diversity of graduating teachers certified in chemistry, physics, and mathematics, and teaching in Alabama. internship will occur over 4 weeks, June 4-28, Monday thru Friday each week Intern students, who require housing, will live on the UA campus and attend numerous activities related to chemistry, physics and mathematics. A weekly stipend of $450 will be given to cover living costs on campus and support interns for their time. Selection will be made by the UA Noyce Scholar selection committee. A completed application must be submitted by May 1, 2018 or until all positions are filled. The summer internships are open to all U. S. citizens and permanent residents who are successful college majors in chemistry, physics or math and have a stated interest in exploring teaching in their target discipline. Examples of internship experiences include: 1) orientation to ongoing UA research programs and labs in science, technology, engineering and math (STEM) 2) visiting high school exemplary STEM classrooms for observation and debriefing 3) assisting in a UA research project lab 4) participating in UA departmental STEM seminars as well as STEM education and certification seminars 5) participating in a short course on using technology for collecting and analyzing lab data 6) teaching prepared STEM lessons to middle grade students, and 7) tutoring in a target discipline at UA remediation/assistance center.